This afternoon I returned to my second, 60 acre, pasture permission. As I had found a musket ball and a small spectacle buckle while wandering around at the top end of the first field on my previous visit I decided to concentrate on that area today and to detect it systematically. It was a warm, still afternoon with hazy sunshine and not a breath of wind. The recent rain had softened the soil below the turf considerably since my last visit so digging and reinstating my holes was generally straight forward. One of the musket balls and the George VI 1940 florin (that’s pre-decimal 2/-, equivalent to 10p) turned up within the first half hour, the other finds being spread across the afternoon. The long, thin doodah appears to be lead or corroded pewter and is extremely soft. Indeed, it was originally slightly more bent than shown as it straightened slightly in being pulled from the soil. The piece of pottery is something of a puzzle, in that it seemed to give a fairly good signal and there was nothing else in the hole. I am therefore wondering whether the glaze contains haematite. The smaller doodah gave a lead-type signal but it doesn’t seem to be heavy enough for lead. Another puzzle. The piece of lead which I assume to be a damaged or poorly formed musket ball, or casting waste from same, was found within a few feet of the previous musket balls. It was, all in all, a good afternoon. My first silver coin, albeit only .500 silver, but it’s a start. And there is the question raised by finding 3 musket balls (and a half) in a very small area. I had a long chat with the landowner afterwards and showed him the finds so far. He is very interested in the history of his land and showed me a Roman grot which he had found as a kid, though he can’t remember whether it was on this land or another farm over towards Stratford. He marked the perimeter of his land on a map for me and indicated the spot where there are supposed to have been cottages at some point in the past. He said that he was told this when a boy by a chap who was then in his 70s and who was therefore probably born in the 1880s, though it’s not clear when the cottages might have been standing. He was also told that Italian PoWs carried out drainage works on the land during WWII so there may be some evidence of their presence, such as coins and uniform buttons, to be found if the report is correct. The landowner also pointed to the highest point of his land and said that there was thought to be “a graveyard” on that spot. There is certainly no church there or nearby, nor is there any indication in the online resources available to me that this is a known burial site. 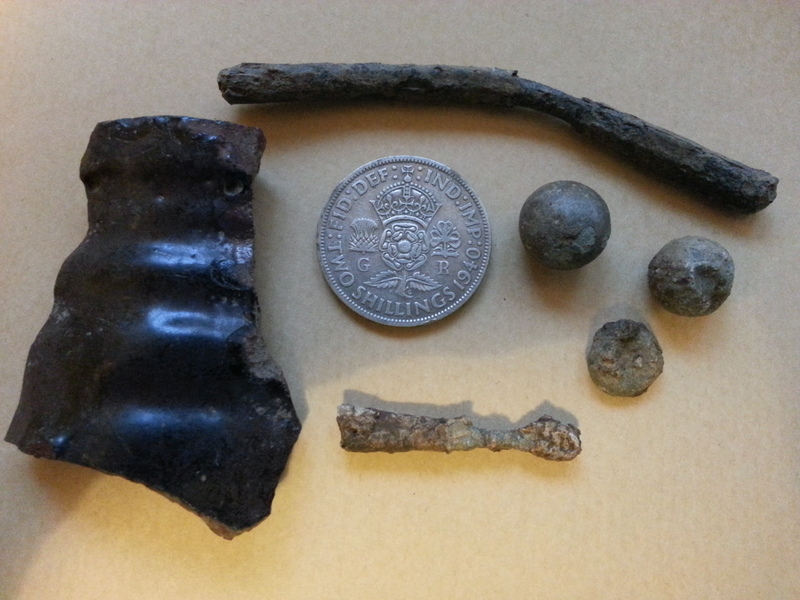 Finds: 1 1940 florin, 2 musket balls, 1 damaged or incomplete musket ball (? ), 2 funny-looking doodahs and 1 piece of black glazed pottery.